Despite changes to recruitment processes, as we have seen with the Civil Service’s recent move to using Success Profiles Behaviours, competency based interviews will still be used at all levels. They may not be as tightly structured as before however they are an effective means of exploring prior experience and are still very popular. They are also still very challenging and in our 121 coaching practice we see clients at all levels who struggle with choosing the right examples to use in their answers. In this article we look at 12 of the most common competencies you are likely to be asked about in your interview. We explain that is involved, we list some of the most common competency based interview questions and we outline some great examples to inspire your answers. A Quick Reminder – What is a Competency Based Interview? A competency based interview is one in which you are asked questions phrased in a specific manner so as to gather information from you about your past achievements, actions or tasks. They may also be referred to as Behavioural Interviews or simply Competency Interviews. Originally seen as a way to measure performance and help with training and development, the use of competencies are widely used in the selection and recruitment process. You may have heard of a Competency Framework and indeed your current or prospective employer will most likely have one. These will cover the competencies required and the positive behaviours for each. In addition, these can also cover the development of the Job Description, Person Specification, Application Form, Job Profile and Advertisement right through to the conduct of the interview itself. Click here for our free Competency Based Interview Questions and Answers pdf – yours to download and keep. You should be aware that UK Government and Civil Service departments are moving away from competency frameworks and adopting Success Profiles as their new recruitment framework for 2019 onward. This consists of 5 elements and one of those is called the Success Profile Behaviours and within this there are 9 behaviours (previously known as competencies) listed as follows: Seeing the Big Picture, Changing and Improving, Making Effective Decisions, Leadership, Communicating and Influencing, Working Together, Developing Self and Others, Managing a Quality Service and Delivering at Pace. Learn more about the Civil Service Success Profiles here. 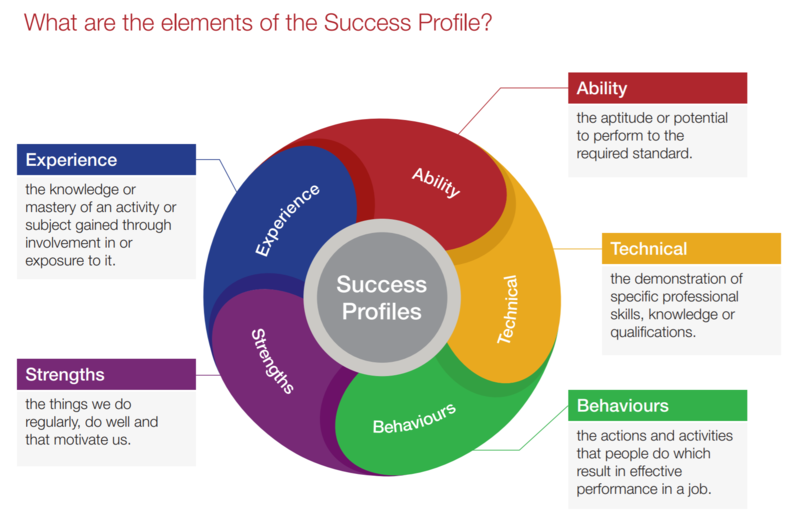 While these form the core of the Civil Service Success Profiles Behaviours, they are competencies that are common to most employers and are still used within Competency Based Interviews. Even if you are not going for a job within Government or the Civil Service, this guide should be essential reading for you. We find that large employers such as the UN, Banks, the NHS, Insurance Companies, Law Firms and indeed smaller and medium sized organisations often adopt methods used by Government. In summary, whatever organisation, role or level you are being interviewed at you will be asked competency questions relating to some of these. Keep in mind the titles may vary slightly from one employer to another however the core skills and effective behaviours are the same. In this guide we examine 12 of the most common competencies you will encounter in any interview. From Seeing the Big Picture through to Deliver at Pace, we outline what is involved, we show typical questions and we give you some example situations which you can use to refresh your memory. When it comes to competency based interviews, especially in Civil Service and Government departments, you should expect questions exploring the competency Seeing the Big Picture. Not only is it one of the 9 Civil Service Success Profiles behaviours it is a competency used by many large employers. So what does the Seeing the Big Picture competency mean? Put into simple terms, Seeing the Big Picture means being able to look beyond your own role and tasks and having an awareness of how your activities feed into the performance of your team, your department and the organisation. For all staff, it is about focusing on delivering the organisations goals in the most effective and efficient way possible. You may see it referred to as Organisational or Strategic Awareness or Strategic Management and it is about your ability to make a connection between your day to day tasks and the overall goals of your department and your employer. Here is a small selection of competency based interview questions related to Seeing the Big Picture taken from the InterviewGold online training. How would you answer? Describe a situation where you worked outside of the scope of your role. Tell me about a time when you have collaborated with another department in order to deliver a positive outcome. Give an example of an achievement which directly contributed to your department goals. Seeing the Big Picture means you should look beyond individual tasks and assess whether or not they will help to meet targets or to get the team to the end goal. For your interview answers, ideally choose examples which took you outside of the normal scope of your work. Here are some potential scenarios to help refresh your memory. Can you recall a time when you…. Took on a task or got involved with a project so as to keep up to date with issues. Got involved in discussions about the direction, mission and goals of your Department or the organisation. Asked for secondment to other teams, areas or departments in order to see the bigger picture. In so many competency interviews we see candidates struggle with answering questions about Changing and Improving (or Change Management as it is often called) and yet it is an activity that is so common. This is a core competency which relates not just to senior positions but is relevant for all staff. What does the Changing and Improving competency mean? Put into simple terms, Changing and Improving involves using your initiative to look for more efficient and better ways to complete the work and taking steps to make the change happen. It is all about being adaptable, flexible, open to and accepting of change being done to you and your area of work. It also includes the concept of continuously learning and developing and dealing with change efficiently. Here is a small selection of competency based interview questions related to Changing and Improving taken from the InterviewGold online training. How would you answer? Talk us through a recent situation when you had to deal with change. Describe a time when you improved the way you work – perhaps found a way to do a task more efficiently. Tell us about a new product, process or service you devised and implemented in your work. All aspects of work can be improved upon in some way and being able to identify these changes and improvements is a skill that prospective employers and interviews will look for. Similarly, being able to adapt to changes is vital and in your answer, you will need to choose a strong and relevant example which demonstrates these skills. Here are some potential examples related to the Changing and Improving competency and which you can use in your answers. Adapt to new ideas, ways of working, a changed environment or location successfully. Support changes to system and adopt new technology with ease. Identify areas that needed improvement and then acted on them by implementing new processes. Looking for sample competency Based Interview Answers? 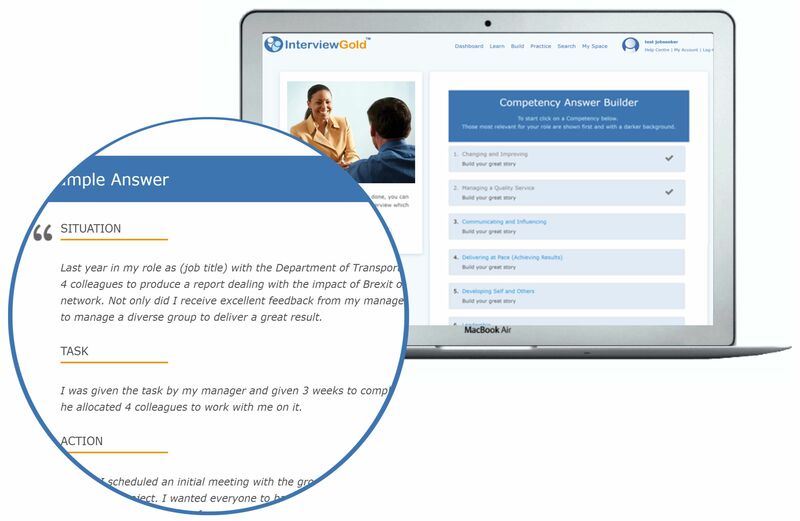 With the InterviewGold online interview training you get more examples along with interview questions, sample answers and the effective behaviours to show in your competency answers. Click here to learn more. Making Effective Decisions or Decision Making as it is traditionally called is one of the most common competencies required at any level and in most roles. While decision making is simply choosing between two or more outcomes, effective decision making is about making sure the right option is chosen. We make decisions daily and they can be as small as deciding what to eat for lunch or have more significant consequences such as determining which home or car to buy. In a work environment the ability to make and take decisions is paramount and you will face interview questions exploring this competency at most levels and in most roles. What does the Making Effective Decisions competency mean? Put into simple terms, Making Effective Decisions means researching, gathering and using data and information accurately to evaluate options. Following a proper process and applying sound judgement and reasoning to come to the right solution. It also involves taking personal responsibility for your decisions, being confident in explaining them and making sure they are implemented and learning from mistakes. Here is a small selection of competency based interview questions related to Making Effective Decisions taken from the InterviewGold online training. How would you answer? Tell me about a recent decision you made where you acted outside of standard procedure. What were the circumstances and what was the result? Talk me through a mistake or something you did wrong in your previous job. Describe a time when you had to choose between a number of different options in order to achieve a particular result. In the interview you will need to make clear the process you have adapted in coming to your decisions. Crucially, you must follow departmental or organisational procedures or guidelines without deviation. The process you follow is critical. Employers want to know that you have used a sound approach to making decisions, you have used judgement backed up by accurate data and evidence. When creating your answer show that you have used your reasoning, insight and objectivity in order to make a decision that will provide the most value and is most likely to achieve success for the specific objective in question. Effective decisions are both an intuitive and reasoned process, showing that you’re careful, thoughtful and considerate. Decision making competency examples you can choose can relate to a personal or work-related situation. They can be regular or one offs, strategic or operational decisions. Here are some potential scenarios to help refresh your memory when choosing your examples. Prioritisation of tasks and how to complete them most efficiently. Scheduling tasks, meetings and people. Dealing with client or customer issues. Handling conflict or other staff problems. The competency Leadership also known as Leading and Communicating is an essential skill. It can help to inspire, unite and organise, give direction, and bring out the best in co-workers. Contrary to popular thought, it is not just managers who show leadership; we can all do so, irrespective of the role or level we are at. What does the Leadership competency mean? Put into simple terms, Leadership means being a role model, inspiring your peers to conduct themselves with authority and integrity and to carry out their tasks with enthusiasm. It involves showing enthusiasm, pride and passion in your work and taking personal accountability for your role. For senior roles Leadership is about creating and engaging others in delivering a shared vision. Here is a small selection of competency based interview questions related to Leadership taken from the InterviewGold online training. How would you answer? Tell us about a time when you showed leadership. What did you learn from the experience? Describe a time you had to deal with a difficult or challenging issue with an employee. How did you handle it and what was the outcome? Describe a time when your leadership skills made a difference. Even when recruiting for starter or junior posts, employers will be looking for leadership qualities. Our advice is to review your experience and identify situations where you showed leadership skills. Keep in mind there is a difference between leadership and management and an interviewer will be expecting you to show that you understand that difference. Leadership can be displayed in many forms and here are some potential scenarios to help refresh your memory when choosing your examples. In a work or personal scenario, can you recall an time when you…. Acted as a role model during a difficult time, conducting yourself with integrity and enthusiasm. Volunteered for projects showing that you’re willing to take on additional duties. Took on additional tasks demonstrating that you’re able to help out your managers and co-workers to deal with their workload. Communication skills are essential in almost all roles and your interview is a perfect opportunity to display yours. You will be examined either by the application form, a test or more likely within your interview using competency based interview questions. Whether you realise it or not you are using your Communicating and Influencing skills constantly both inside and outside of work. Staying in touch, making requests, giving instructions, talking through options and decisions, all the simple actions in our lives involve being able to listen, understand and respond. We use our Communication skills to build rapport with others and to get results. What does the Communicating and Influencing competency mean? Put into simple terms, Communicating and Influencing means getting your message across in a way that is understood by your audience. Being able to communicate clearly, honestly and concisely both orally and in writing in a persuasive and accurate way. A major part is being able to take the views of other people into consideration and using your skills to persuade them of the value of your ideas. Here is a small selection of competency based interview questions related to Communicating and Influencing taken from the InterviewGold online training. How would you answer? Talk me through a time where you used your communication skills effectively resulting in a successful outcome. Describe a time when you successfully conveyed your ideas to an audience who were unfamiliar with the subject matter. Tell me about a time when you had to communicate complex technical information to a client. What was the situation, what approach did you take and what was the result? Being able to effectively communicate with colleagues, customers and managers is a vital part of your job role and is a skill that interviewers will want to see. You will use these skills on a daily basis from simply drafting an email, making a phone call, writing a report, or giving a presentation. In your interactions with colleagues, managers and your team you use a combination of verbal and non-verbal skills in order to understand, persuade and convey your message It isn’t always about what you are saying but the way you communicate it. In order to answer questions successfully you will have to think of examples of when you were effective when communicating either in the workplace or outside. Effective communication and influencing can be displayed in many forms and here are some potential scenarios to help refresh your memory when choosing your examples. In a past situation, did you…. Communicate complex information clearly in a straightforward, honest and engaging manner perhaps in a written report or verbal. Give a presentation on a topic to a group of people, dealt with questions and won buy in for your recommendations. Plan ahead, researched the target audience and made a positive decision to tailor the language and format you used. Get The Job With InterviewGold! Discover how to answer any competency question with 100% confidence. Being able to work with others in a team is a skill that impacts all aspects of our lives. Whether it is working together with colleagues, friends or family, it is important to be able to work effectively in a group to achieve a goal. When you can work well in a team, a lot more can be achieved both on an individual basis and as a group as a whole. Goals can be met and tasks can be completed faster and more efficiently. What does the Working Together / Teamwork competency mean? Put into simple terms, Working Together or Teamwork as it is more commonly know means being a team player, contributing, collaborating, offering support and help to colleagues, sharing ideas, giving advice and input in order to get something done. It involves building relationships within your own area and outside, and being enthused about sharing knowledge, information and learning. Show genuine interest when listening to others. Here is a small selection of competency based interview questions related to Working Together / Teamwork taken from the InterviewGold online training. How would you answer? Tell me about a time when you have had to rely on someone else in order to get something done. Describe a situation in which you were a member of a team and a conflict arose within the team. What approach did you take? Even in roles where you predominantly work alone, there is usually an element of teamwork involved, whether it is with different departments, partners or external suppliers. It can be as simple as working with a colleague, accepting, offering support, sharing ideas, giving advice and help in order to get something done. Working together can be displayed in many forms and here are some potential scenarios to help refresh your memory when choosing your examples. Shared your ideas and knowledge in some way, perhaps with a new colleague or in a team. Helped a staff member returning to work after illness or boost their morale in some way. Supported your colleagues with their workload when required; perhaps offering rather than being asked. Most individuals who are successful in their careers share the characteristic of self-development. In fact, continuous professional development is a key activity in all our careers. Both in the workplace and outside, continually looking for ways to develop and improve yourself is an excellent skill. What does the Developing Self and Others competency mean? Developing Self and Others involves looking for gaps in your skills and knowledge and making plans to overcome these gaps. It is all about taking responsibility for your own development acting on feedback from colleagues or appraisals and indeed sharing your learning with others in your team. It is sometimes referred to as Empowering Others and for senior posts, in addition to the above, it is about helping your team to develop their skills to seek learning opportunities and to support the development plans of all colleagues. Here is a small selection of competency based interview questions related to Developing Self and Others taken from the InterviewGold online training. How would you answer? Describe a time when you helped a colleague improve their work effectiveness. Tell us about a time when you enabled a team member to develop a new skill. Can you describe a time when you have had to deal with poor performance and the approach you took to resolve it. During most interviews, you will likely be asked about developing self and others using competency questions. The interviewer will be looking for answers that include evidence and examples of times when you have actively sought to develop your own skills and encouraged and helped others to expand their knowledge. Identified ways to develop yourself, completing all in house training, perhaps requesting additional training courses or other on the job learning. Reviewed your performance to make sure output was up to standard. Made a mistake and learned from it. This competency can be confusing for lower level applicants who see the word ‘managing’ and conclude it must either relate to senior posts or to those managing staff in some way. That is not correct as it is relevant for all staff at all levels and relates equally to how you complete your area of work right up to managing large teams and delivering major projects. You will see this is another of the 9 Civil Service Success Profiles behaviours. What does the Managing a Quality Service competency mean? Put into simple terms, managing a quality service is all about completing your job and meeting your objectives in the most efficient and effective way. It can involve providing the best possible service to your customers and clients and these can be external or internal such as other departments, teams or stakeholders. Here is a small selection of competency based interview questions related to Managing a Quality Service taken from the InterviewGold online training. How would you answer? Can you describe a time when you have been proactive in finding a solution to a problem encountered by your customers. Give me an example of a time when you dealt with a difficult client situation. Describe a time when you had to work exceptionally hard to provide great service. What did you do and what was the outcome? Managing a quality service can be displayed in many forms both inside and outside of work and here are some potential scenarios to help refresh your memory when choosing your examples. Dealt with a particularly difficult customer complaint and personally managed it to ensure the customer got the highest level of service. Did something extra to improve the level of service you gave a client, perhaps went over and above what the customer expected while always working within your policy and procedures. Adapted the way you completed a task or serviced a customer so as to get a better result or complete it faster or to a better standard. Get instant access now to sample answers to all these competencies in the InterviewGold system. Delivering at Pace is all about getting the job done on time and to the expected standard. You may also see it referred to as Achieving or Delivering Results and it deals specifically with the performance of tasks. This is another of the core 9 Civil Service Success Profiles behaviours and it encompasses a number of additional competencies, such as Planning and Organising and Time Management. It covers the ability to maintain focus and dedication, to follow procedure, and to use your own initiative. What does the Delivering at Pace competency mean? Put into simple terms, Delivering at Pace means producing top quality results within pre-set and often tight deadlines, making sure that you monitor your and your team’s progress and overcome any obstacles. You must stay focused on the outcome, even when the going gets tough, staying positive throughout and bringing your colleagues and team with you. Here is a small selection of competency based interview questions related to Delivering at Pace taken from the InterviewGold online training. How would you answer? Give us an example of when you delivering and exceptional result detailing obstacles you encountered. Tell us about a time when you were unable to complete a talk within the set deadlines. Describe a situation when time when you had to make a change in order to deliver up a project. To be effective at Delivering at Pace and Achieving Results you must be focused on offering a timely performance with enthusiasm. It is also all about taking full responsibility and accountability for the outcomes and results of your work. Delivering at Pace and Achieving Results can be displayed in many forms and here are some potential scenarios to help refresh your memory when choosing your examples. Prioritised your tasks in order to get through a heavy workload. Dealt with changes to your workload, perhaps your boss asked you to complete a task towards the end of the day. Encountered a major obstacle when delivering a project, something that you ultimately overcame. Problem Solving is a competency which is in demand from pretty much all employers. It refers to the act of effectively finding solutions to problems and implementing them. What does the Problem Solving competency mean? Put into simple terms, Problem Solving means recognising a problem, analysing it objectively using your experience, initiative and intelligence. It involves developing and implement solutions having considered a variety of alternatives and options and comparing the risks and benefits of each and the impacts on others. At all times you must apply clear pre-set procedures or policies as per your department or organisation. Here is a small selection of competency based interview questions related to Problem Solving taken from the InterviewGold online training. How would you answer? Tell me about an occasion when you went out of your way or spent a significant amount of time analysing the cause of a particularly complicated problem. How did you proceed and what was the result? Describe a complicated problem you have had to deal with. How did you tackle it and what was the outcome? Talk through a situation where you developed an innovative solution to a complex problem. Problem solving means being proactive and positive. It is best to show that you are aware of and look for issues constantly, you don’t shy away and wait for instructions or worse wait until the problem gets bigger before you do something about it. There will be a whole range of scenarios you can choose to talk about and here are some potential scenarios to help refresh your memory. Noticed something going wrong with a task or project, perhaps an early indication that it just would not work. You raised this as an issue and you suggested a change which kept the activity on track. Came up with an innovative solution to a problem that had been around for some time and nobody else could solve. Realised that a significant mistake had been made that could have derailed a project being delivered on time and you resolved it successfully. Planning involves having an objective in mind with a clear vision of the end result and how you will get there. As well as having the final goal in mind, planning will often require setting regular objectives or milestones which can help to track your progress. With planning, you may choose to set up an action plan if it is a specific project. Alternatively, it may suit you to have a schedule or timetable with deadlines so that you can manage your time well. Organisation follows on from planning, by knowing your objectives and how to meet them through planning and prioritising. This can help you to maintain focus on your goals and ensure you can manage all of your responsibilities, activities and commitments effectively. Organisation can come simple aspects such as keeping your workplace tidy and logical to adjusting to an organisational structure. Finally, prioritising enables you to focus on the most important and urgent tasks. When it there are lots of deadlines and activities to plan, you need to prioritise where your focus should lie. Here is a small selection of competency based interview questions related to Planning and Organising taken from the InterviewGold online training. How would you answer? Tell us about a situation where your time management skills let you down. Describe a time when you used your organisational skills effectively to complete an important activity. Talk through a situation when you planned effectively so as to complete a number of simultaneous tasks on time. With proper planning, organisation and prioritisation, you can get more done while saving your team and department both time and money. There will be a whole range of scenarios you can choose to talk about and here are some potential scenarios to help refresh your memory. Created a deadline and stuck with it despite obstacles and even though you were given additional tasks. Were really disciplined with your time, didn’t become distracted or give in to procrastination. Had a long list of tasks and prioritised them. Managed your time, allocating correctly to each task and getting the work done successfully. Differences of opinion and clashing perspectives can lead to disagreements both in and out of the workplace. When people are working closely together, it is inevitable that conflicts will happen. Furthermore, it is important to prospective employers that you can manage these disagreements effectively and fairly. What does the Managing Conflict competency mean? Put into simple terms, Conflict Management includes the ability to identify and deal with clashes between people efficiently, sensibly and reasonably. Interviewers ask these questions because they want to find out about your own ability to manage conflicts and your general interpersonal skills. Here is a small selection of competency based interview questions related to Conflict Management taken from the InterviewGold online training. How would you answer? Tell me about a time when you experienced opposing views on your team. What did you do to overcome this? Describe a time when you had to manage conflict in your team or among your colleagues. How did you approach this situation and how did you resolve it? Conflicts can take place in all aspects of work and between any members of the team. A disagreement could occur between colleagues, departments or managers and it could be about anything from the best way to work on a new project to deciding to recruit more team members. Conflict Management can be displayed in many forms and here are some potential scenarios to help refresh your memory when choosing your examples. Resolved a disagreement between two members of your team, between team or departments. Customer service issues can escalate into conflict without management. Dealt with a situation where a member of staff had different ways of working or different ideas about how best to achieve an outcome. 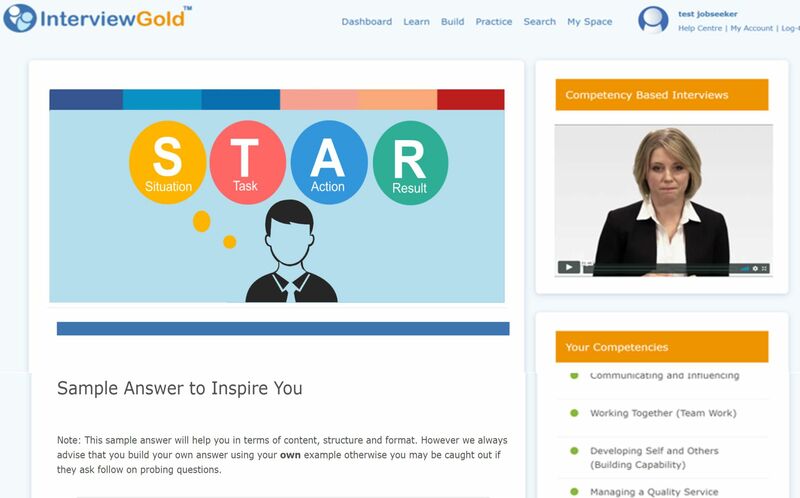 With the InterviewGold online training system you have access to a host of great content all designed to help you succeed in competency based interviews. You get questions, sample answers, the positive behaviours to use along with expert training all on one easy to use online package. You can use the InterviewGold system to help with all stages of the process including the application, personal statement, assessment centre and of course the interview. Click below to get Instant Access to InterviewGold online training.